We’re hard at work on the latest Mobile Social Interbike. Like last year, we’ll ride from the Sands, down the Strip, to a destination unknown. Vegas is offering unheard of deals and we’re working right now on the best one for us and fun for you. 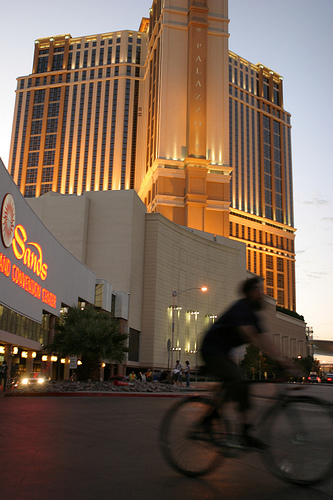 All you need to do is show up outside the Sands Convention Center (near the Bike Locking entrance) with your bike and we’ll do the rest. It’s our hope that the MoSo Interbike turns out like this Scopitone video: kooky, big-hair dancing in merlino wool jerseys and bike shorts with high heels. Stay tuned and please RSVP now so we can get a bike count.